In the business world, women haven't always had it easy. Until the end of the 20th century, it was uncommon for women to work at all. And even once we entered the hallowed halls of American companies, we struggled with unconscious bias and pay disparities. Fortunately, though, 21st-century business innovation is benefiting women in an unprecedented fashion. Let's explore a few recent innovations that have changed working women's lives for the better. Werk is an analytics dashboard that helps organizations offer targeted flexibility options to their workforces. The company's proprietary assessment methodology uncovers how well an organization is meeting its employees' needs and the flexibility programs that will drive the greatest impact and return on investment. Werk aims to make flexibility access equitable across gender lines and invests in individual employee success by offering personalized flex reports with the exact information working women need to perform their best at work and at home. Also, women's flexwork thought leader Kathryn Sollmann recently launched The Flexwork for Women Alliance. It's a community of recruitment and career firms that partner with progressive employers to offer U.S. women better work/life integration opportunities ranging from job sharing and flexjob creation to returning to the workforce after a long absence and changing your career. 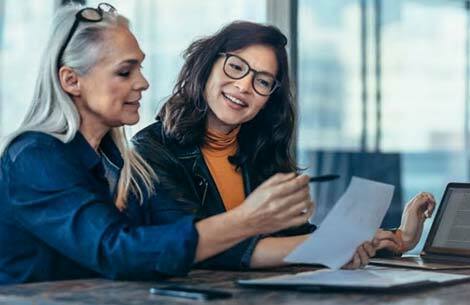 The Alliance aims to help greater numbers of women stay in the workforce in a less life-consuming way as they care for both children and aging parents—and achieve professional fulfillment and long-term financial security in the process. Bumble made headlines a few years ago when it became the first dating app to mandate that women had to make the first move. Now, the company behind Bumble is spreading its wings to offer Bumble Bizz, an online network in which women can take the initiative to make professional connections on their own terms. Just like the original Bumble sought to make dating less uncomfortable for women, its younger sibling Bumble Bizz wants to provide a safe forum for working women to collaborate, share and learn alongside one another. 21st-century business innovation is benefiting women in an unprecedented fashion. Next, if you were a working woman without an office, you headed to a coffee shop or took a seat alongside tech dudes at co-working spaces. The Wing's mission is a lofty one: advance women professionally, civically, socially and economically through community. Aiming to create new opportunities, ideas and conversations that lead to greater prosperity for smart women, the membership-based Wing provides access to cozy workspaces, phone booths, conference rooms, cafes, and personal grooming areas in more than a dozen cities around the world. Finally, Women Who Startup is a special learning platform serving a global group of female entrepreneurs invested in business innovation. The founders understand that launching a business is hard work and that women are often balancing multiple personal and professional priorities at the same time. Whether you need a particular type of developer, are in search of a growth strategy that actually works, or are on the hunt for a co-founder, Women Who Startup is a valuable support network. GapJumpers is recruitment software that allows companies to screen job applicants without showing employers any biographical information to start. Known as blind hiring, GapJumpers' process involves creating a list of skills required for the job and designing an online test for each applicant. The client selects candidates to interview based on those test scores, and only then sees their names and resumes. How does this help working women? Another business innovation in the software category is interviewing.io, an app that helps employers conduct less-biased technology job interviews by disguising candidates' voices so interviewers can't tell if they're male or female. Business innovations like flexibility drivers, women-first networks, and bias-busting software are essential as working women seek new challenges and opportunities in a competitive entrepreneurial climate. By helping to level the playing field, these products and services help women overcome well-known obstacles to achieve their goals.